As an initiative is tough to beat. Miss Carol proclaimed that it was Ladies Night this morning and then I forgot that that meant I had to cook for myself. I forgot and then forgot again, and all the sudden, Mister Wonderful with His Mirrored Aviator Sunglasses had pulled up out front to pick up Miss Carol for Ladies Night in His Yellow Corvette. He never comes in, just drives onto the lawn and toots his horn. Miss Carol swears he picks them all up for Ladies Night but I can’t for the life of me reckon how they all fit into that little car. After I got tired of waving goodbye and Cutter and Tug had slouched back into the living room I went to find something in the ‘fridge to make for dinner and to grab the carrots that’re Cutter and Tug’s bigtime treat. As I was pawing through the refrigerator with them whining and wanting I found me some leftover ground beef, some cheese, and some tortillas. And suddenly? I knew I was destined for glory- Oceandoggy cheesy beefy bean burritos. Ooh baby. So this is what I did. First I cooked up some pinto beans, they’re easy. Empty a can into a saucepan, season with salt and pepper and whatall and turn ’em on high for like 10 minutes max till they’re boiling and then turn ’em down to low. As they heat moosh ’em with a spoon, kinda crushing the beans along the bottom and sides of the pan to soften them and make a beany gravy. You’ll know when you’re doin’ it right. While the beans are cooking drink beer and watch TV. Cookings nice that way. 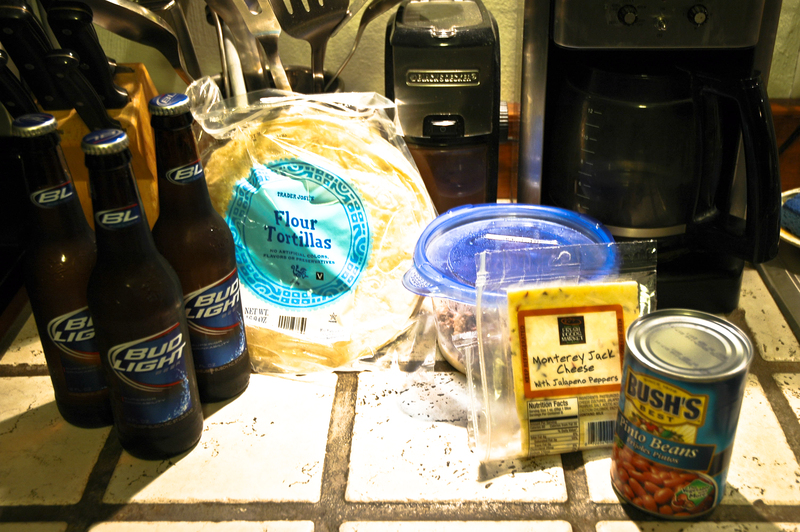 After about an hour of slurping Buds and mooshing beans put a fresh flour tortilla on a paper plate (yes I said paper-no clean up), put some cheese and leftover ground beef on ‘er and microwave her for about a minute. Garnish with hot beans, roll it up, and slurp it down. It’s heart stoppingly sloppy but oh so damn good. –>I could eat something like that a few times a week and be happy. Yum! With all the snow we got this weekend, I feel like that’s all we’ve done, Eat and Drink.